Agile continues to be a buzzword. This durable adjective shows up in my inbox applied to strategy, marketing, finance, entrepreneurship, and cooking, in addition to its more established focus on software and systems development. This would seem to have nothing to do with the Camino de Santiago, a venerable pilgrimage walk, but read on. The Camino refers loosely to a family of treks ending in the city of Santiago de Compostela in northwest Spain. Historically, it was a pilgrimage. For some it still is. Others do it for sightseeing, exercise, adventure, curiosity, and as other motives as there are walkers. 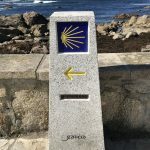 A Camino can range from 100 km (the minimum required to get a Compostela – an official certificate of completion) to 800 km (from Saint Jean Pied de Port in France). For those with more time and tougher feet, even longer Caminos are possible. The route takes one on trails, paths, and roads through forests, meadows, cities, and towns. Some of the way is hilly, some flat. The path can be rough or easy under foot. You may encounter rain, wind, heat, cold, and fog. The scenery and townscapes can be beautiful, monotonous, ugly or intriguing. There is no Yellow Brick Road, but stylized blue and yellow route markers abound. You don’t know who or what is around the bend. It may be a fountain with refreshing water, nonpotable water, no water at all, or in at least one case, wine. Delightful days can be punctuated by long slogs. Eating and sleeping are part of the adventure, especially on days where you’re not sure where you’ll end or get to the village you planned, but find no available rooms. They can be at cafes and restaurants, pilgrim hostels, or hotels. These are incredibly varied. Some are outstanding, some poor, a few you just don’t want to stay at. Most are inexpensive to moderately priced, some simply accept donations. Rarely, I have found myself in some village after dark with no place open or available. In these and many other dimensions, the trip itself is amorphous and ambiguous. Some parts of the trail invite one to linger, others to keep on without pausing. Walking hundreds of kilometers, the mind as well as the body wanders. Among these wanderings is the notion that pilgrimage and product development are more similar than you might think. 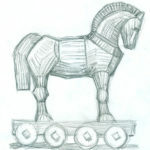 A project such as a trek or a new product can seem, ex ante, simple or at least straight forward. Functional specifications for a defined market or starting point and final destination. In the case of a trek, get to the starting point, walk until you arrive to the defined finish point, declare the goal attained, and you’re finished. Yet the number of tasks, decisions, and risks multiply quickly. Hmmmmmm, starts to sound like we’re still in the office. My feet hurt, it’s been cold raining for three days, what am I doing here? As in many version 0 products, simplicity is a good, though not the only, choice. A meme along the Camino is a depiction of a medieval pilgrim. He wears a cloak and sandals, carries a walking staff, drinking gourd, and small money pouch. Without backpack, change of close, or extras of anything, our prototypical pilgrim traveled light and relied on the hospitality of monasteries or churches for food and shelter. For the contemporary trekker, options range from planning down to the kilometer and hour to just showing up improvising a response to whatever you encounter. If the goal is to check this trip (or product feature) off your list, the first option may be the most efficient. If the goal is to maximize the experience and serendipity of trip, plan less. An agile approach is more volatile. You will end up staying at both unexpectedly funky yet satisfying places, meet a wider cast of characters, have a broader variety of meals and encounter more not in the guidebook. In effect, you respond to the feedback and demands of the environment. There are down sides. The resources for your project may be yanked just as on your trek, It could get dark, cold, and rainy with neither food nor shelter in sight. In the case of the Camino, the risks have been worth it. There is certainly a place for unagile in both product development and adventure. One doesn’t do agile development on, for example, a power plant. The “pilgrim,” in this case climber Alex Honnold, chooses to climb the more than a thousand meter vertical rock face of Yosemite’s El Capitan without the support of ropes or other safety equipment. Physically, Alex is supremely agile, yet he accomplishes his climb, by meticulously planning and rehearsing, until he has virtually memorized every step of the mountain. Whatever you do, enjoy the walk. As they say in Spain, and perhaps should at product meetings – ¡buen camino! This entry was posted in Uncategorized on January 31, 2019 by Peter Buechler. It’s seldom mainstream news, when a retailer changes its return policy. 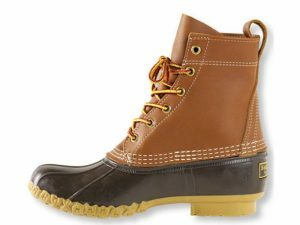 When venerable LL Bean did just that, it was. National media as well as the trade press noticed. Back in the day, service at Bean’s flagship store in Freeport, Maine or from one of its mellow phone reps for catalog shoppers, was deservedly legendary. Case in poi nt: I once ordered a set of bike panniers from Bean on sale. They were fine, but eventually one of the brackets, which attached them to rear rack, fell off. Some months later while vacationing in Maine, I stopped at the store to ask whether I could buy a replacement bracket. The salesman looked at one of the panniers and left to do a few minutes of research. He returned, apologized that that product was discontinued, and without my asking (or expecting), offered me the full cash price and an apology. That was then. A recent visit to a Bean store, is a different experience. The number of sales associates seems reduced and those remaining are seen neither as eager or knowledgeable as in days past. Gone is the free shipping on all items. Returns will be allowed only within one year of purchase, and only if the customer has a receipt. Bean is privately held and does not release detailed financial statements. Estimates from Privco show less than 1% annual growth over the last five years despite increasing the number of domestic retail locations by a third (from 31 to 42). For Bean, sales growth has no longer been a walk in the woods. Bean came to believe, not implausibly, that a number of customers were exploiting their return policy. For example, by returning merchandise bought from third party discounters for full price from Bean. In the face of no growth, they assume the tired strategy of squeezing expenses including returns. But at the expense of diluting their primary value proposition of exceptional customer engagement and service. “Fraudulent” returns – return of merchandise not bought from the retailer or used for more than a trial period – can be a real problem. The Wall Street Journal reports that some sellers, such as Best Buy, tightly monitor returns. They refuse to grant returns to customers, whom their system flags as being “excessive returners.” This can happen even if the return conforms to Best Buy’s stated return policy – with receipt, within 15 days of purchase, and unopened. Of course, Best Buy unlike Bean, was never known for customer service or customer loyalty. What else could Bean do? Rather than jeopardize its brand image and position and surprise customers by declining their returns, it could institute better sales tracking. Thus, if Jane Q. Customer chooses to return a pair of boots, its purchase would be available at any of their sales terminals. This is already common practice. Bean could brag about the new full year to return policy with no receipt required. The news has event has by now been largely forgotten, but the underlying problem remains. Beans still needs to grow sales. This might start with revamping their rather tired and tiring ecommerce site. But that’s material for another post. Organizations should often get relevant feedback from customers, clients, or audiences. Increasingly though, it seems every time I transact with a firm, I get a follow-up message asking me to evaluate the experience. This could provide useful information to the offering organization, improve its service, and even strengthen the provider client relationship. In practice, it usually does none of these. All too frequently, the survey, questionnaire, or interview becomes a license to pile on reams of tangential or irrelevant questions. They seem to figure as long as you’ve clicked a respond button, they have a license to ask all sorts of questions in lengthy detail. In this age of Big Data and machine learning they seem to think, why not bulk up a data store? Some time, they may even try to analyze it and discover amazing insights. Case in point – calls to technical support. Take, Adobe (please). After receiving what passes for “support,” you get a message asking you to “take a moment to let us know how we’re performing.” After the fourth or fifth screen of increasingly detailed yet irrelevant questions, you may feel taken advantage of. As, I suspect, many other customers did; I closed the window and abandoned the survey. On the opposite end of the spectrum are, firms such as Blue Host. As you are being queued to speak with a support specialist, a recording tells you that if you wish, you may stay on after the call and answer a single question. The one question rates the service, similar to a Net Promoter Score. It should be obvious to organizations, which abuse the privilege of asking customers for feedback, that they compromise both their customer relationships and the quality of their data. Apparently the part of the organization doing or commissioning the research is not the part, which lives with the consequences of irritating customers. Some firms are not content to let the memory of bad service badly engineered fade but send “Friendly reminders” to customers who don’t want to waste yet more time by responding to surveys. This should not be a difficult problem. It does require the organization to think about what information it should collect. Would it be able to act on such information to produce some improvement noticeable to clients? If not, think again before clicking that send button. This entry was posted in Uncategorized on January 26, 2016 by Peter Buechler.